Two days ago, I took you through making a sweet Italian pastry dough called pasta frolla. 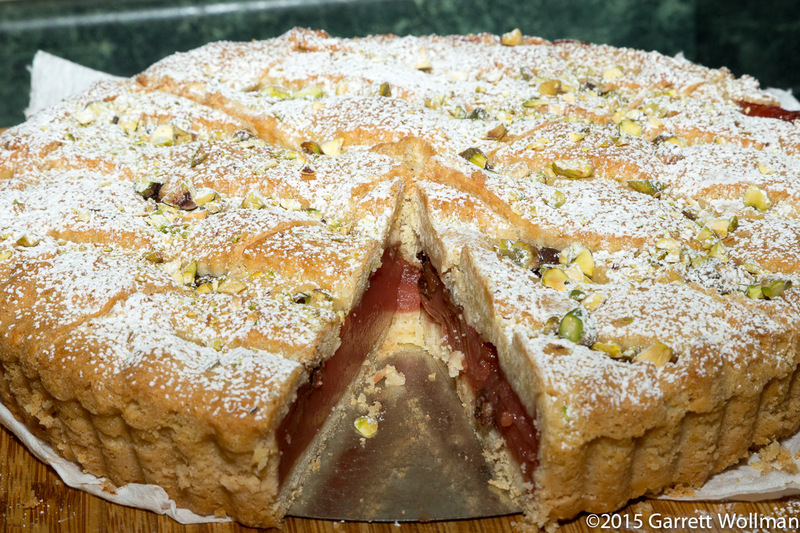 Yesterday, it was gelo di mellone, a Sicilian watermelon pudding. 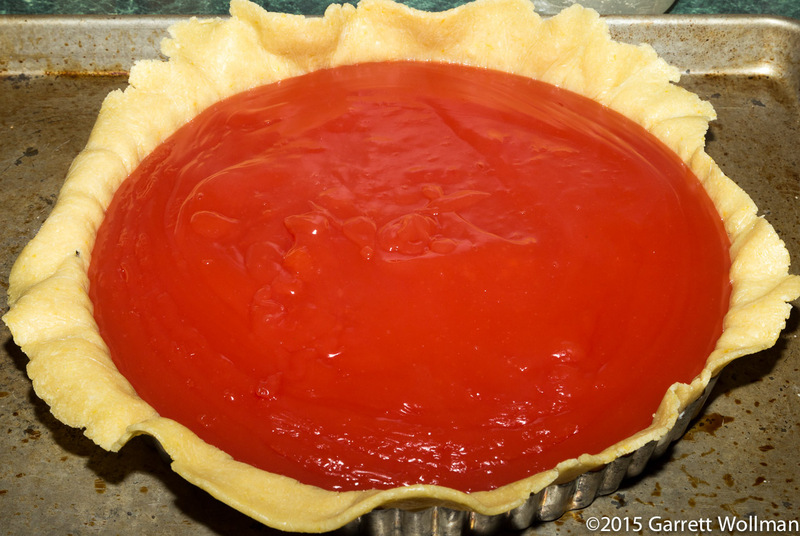 Now it’s time to put them together: crostata al gelo di mellone, or watermelon pudding tart. It’s the featured item on the front cover of Rosetta Costantino’s Southern Italian Desserts (Ten Speed Press, 2013), and thus in all likelihood the reason I bought this book in the first place — although at the time I had no idea that it was made with watermelon. I brought this tart in to the office on Tuesday, the first work day after the Memorial Day holiday, and nearly everyone absolutely loved it — which was even a bit stronger than I felt about it. The one person who didn’t love it thought that the watermelon pudding had too much of a cornstarch flavor to it, which I can’t really dispute (it was an issue for me as well, the flavor of watermelon being so subtle). Of course half of tasting is done with the eyes, and everyone was blown away by the color of the watermelon pudding, at least. Let’s look at how to assemble the tart. The first step is pan preparation. 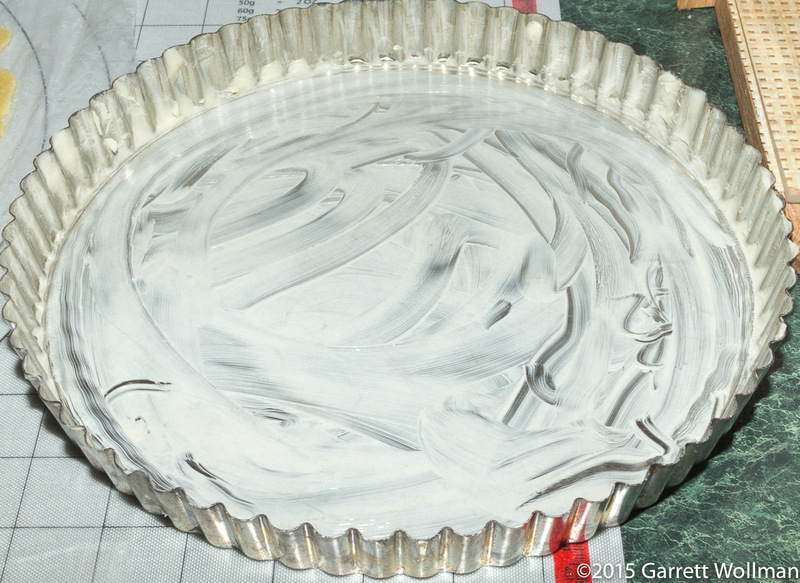 Costantino suggests using either a springform pan, or a tart pan like this one, ten inches in diameter. I would have used the springform except that I don’t actually have one that big. The pan preparation is simple: just unsalted butter smeared onto all the contact surfaces. 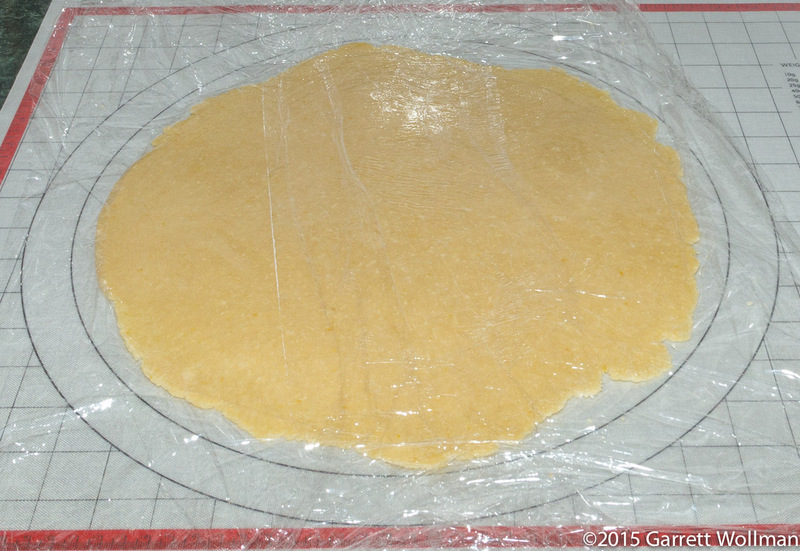 Next, the pasta frolla (sweet shortcrust pastry) is removed from the refrigerator — first the larger portion, for the tart bottom and sides, and then the smaller portion for the top — and rolled between sheets of plastic wrap. Because of the way this tart is assembled, it’s important not to use flour when rolling it out, so the plastic wrap is a necessity here. (If floured in the usual way, the dough would not adhere to itself.) 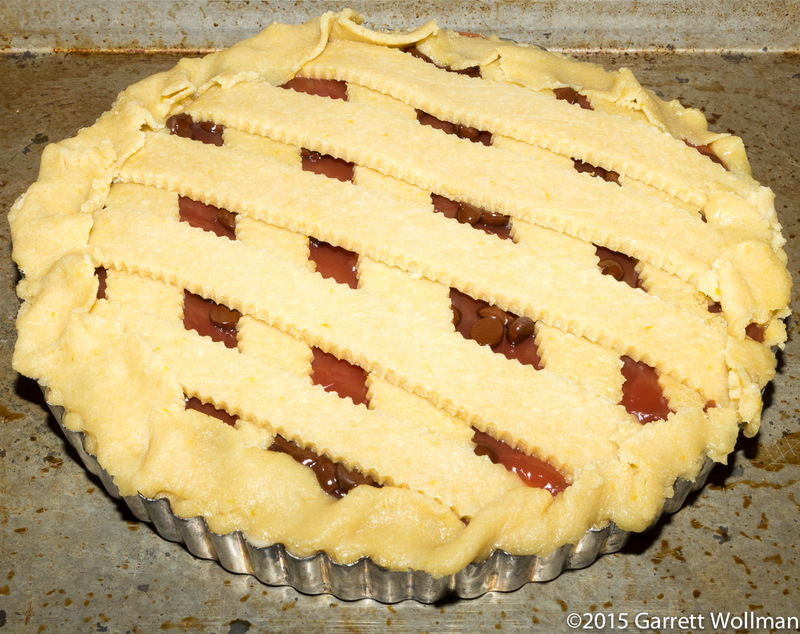 The bottom gets rolled out to 13 inches in diameter (allowing for 1½” sides), and the top is rolled to about 10½ inches; the top is cut into strips using a pastry wheel, while the bottom is fitted into the tart pan, and both go back into the refrigerator while the gelo filling is prepared. 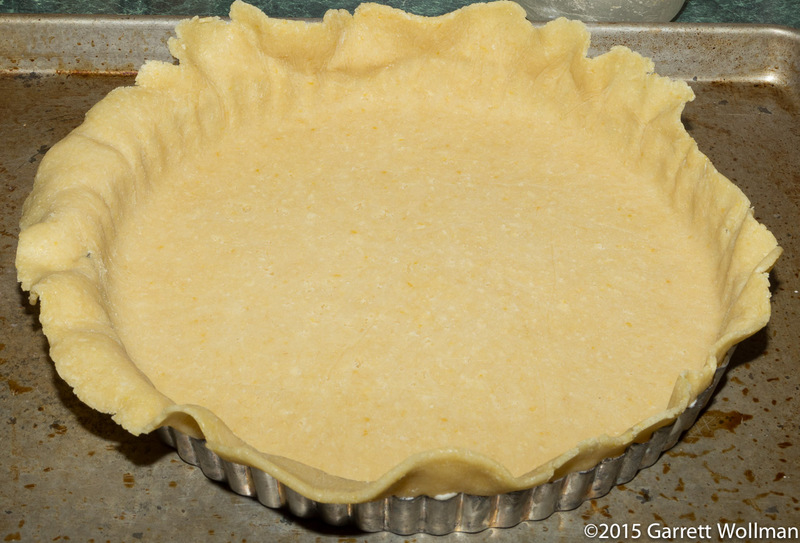 While the gelo is still warm from cooking, the prepared tart shell comes out of the fridge. It’s a bit stiff at this point, but the warm gelo will soften it to the point that the edges can be folded over. That just looks pretty, doesn’t it? But for something that’s supposed to be watermelon, there’s a little something missing…. 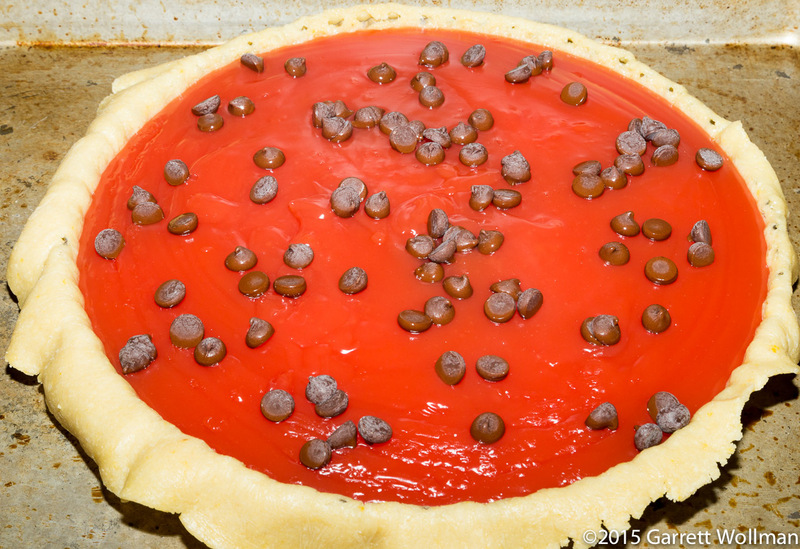 OK, it’s a little bit goofy, but the chocolate chips are supposed to represent watermelon seeds. A couple of my tasters don’t like the combination of chocolate and fruit, and would rather have done without, but I followed the recipe — except that I should have used mini chips, rather than these full-sized ones. You’ll notice that in no time at all the pastry has softened to the point where the excess has not only fallen over but in parts has been cut off by the sharp edge of the tart ring. The crostata is finished by making a flat lattice across the top with the reserved top crust strips, then folding the excess over. Since no egg wash is used on this crust, it’s important that it be tacky enough to stick together just from contact, which rolling under plastic wrap helps to ensure. I did realize, however, that I should have rolled the top out as a rectangle, so all the strips would be the same length and thickness. 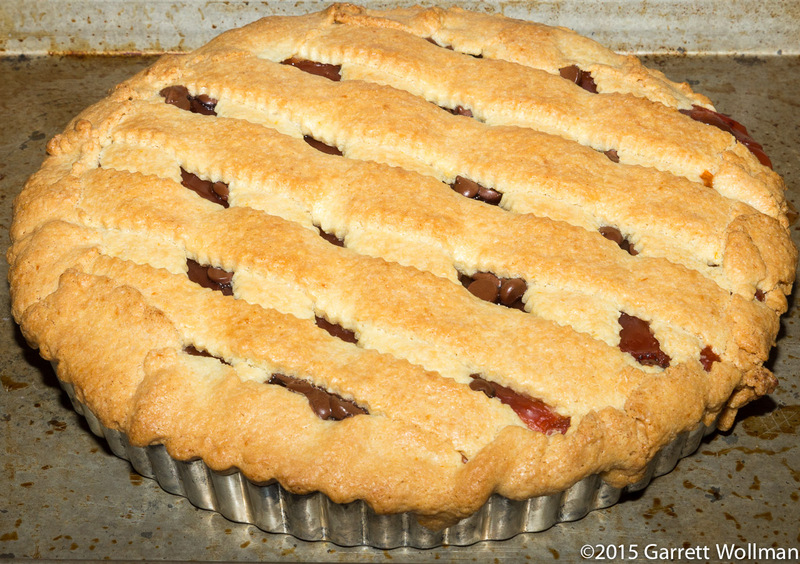 After 45 minutes in the oven, the crostata al gelo di mellone comes out looking lovely — but it’s not done yet. It will cool completely in the tart pan, and then be refrigerated for several hours to set the gelo. For a final garnish, chopped pistachios are sprinkled on top, followed by a dusting of confectioner’s sugar. This obviously must be done immediately before service, lest the powdered sugar turn gummy (which it will do as it absorbs moisture, either from a still-warm tart or from the humidity of the refrigerator). Of course you were waiting for that cross-sectional view of a single slice of tart on a plate, right? After baking and cooling, the gelo slices and holds together perfectly, with no leakage even after a couple of hours at room temperature. 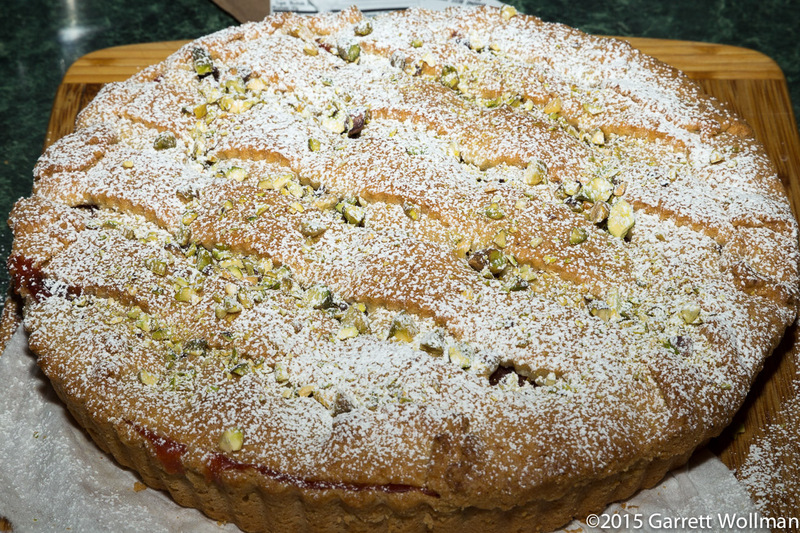 I very much wanted to do a side-by-side comparison of my tart with the actual front-cover artwork for Southern Italian Desserts , but I couldn’t figure out how to get permission — in the mean time, you can compare the photo above with the artwork on the Random Penguin site (right-click or option-click to open in a new tab or window!). I sliced this crostata into 12 servings, and I suggest that you do likewise — I think an eight-slice portion is too large. 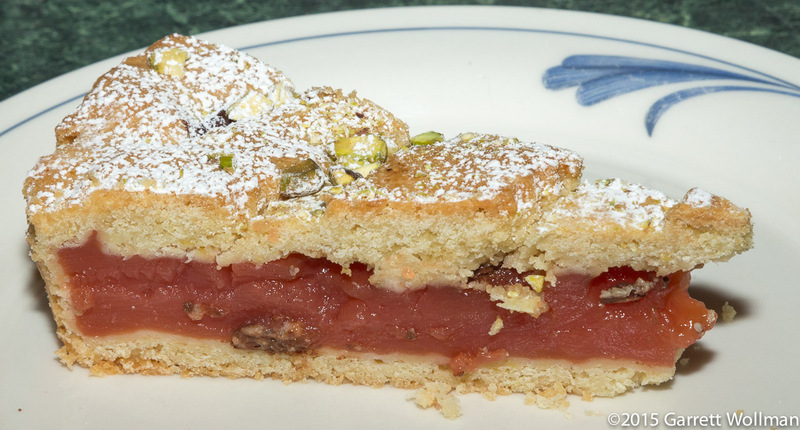 Gallery | This entry was posted in Food and tagged crostata, fruit, pie, recipe, Rosetta Costantino, tart, watermelon. Bookmark the permalink.